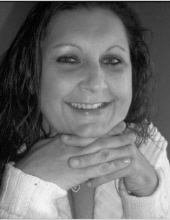 Marjorie Beth Caddell, age 48, of Leach Lane, Williamsburg departed this life on Tuesday, November 20, 2018 at her home. She was born on February 9, 1970 in Corbin, Kentucky to Robert Caddell and the late Mary (Teague) Caddell. She was preceded in death by her mother, Mary Caddell. She was a member of the Wolf Creek Baptist Church. She is survived by her three daughters, Amber Caddell (fiancé Russell Cooper), Brittany Avery (Jeremey), and Whitney Fuson (Dallas) all of Williamsburg, Kentucky; two grandchildren, Jesse Bargo and Elijah Bargo; father, Robert Caddell of Williamsburg; two sisters, Sharon Weaver (Mike) and Rhonda Phillips (Preston) both of Williamsburg; special family friend, Shannon Mills of Williamsburg; several nieces and nephews; and a host of other family and friends to mourn her passing. Visitation will be after 6:00 P.M. Saturday, November 24, 2018 at Croley Funeral Home. The Funeral Service will be at 1:00 P.M. Sunday, November 25, 2018 at the Croley Funeral Home Chapel with Rev. Hoyt Caddell officiating. Following the Service she will be laid to rest in the Wolf Creek Baptist Church Cemetery. To send flowers or a remembrance gift to the family of Marjorie Beth Caddell, please visit our Tribute Store. "Email Address" would like to share the life celebration of Marjorie Beth Caddell. Click on the "link" to go to share a favorite memory or leave a condolence message for the family.